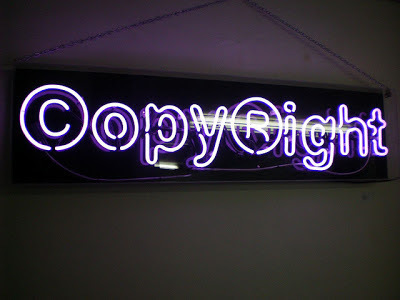 Today I attended a copyright information session for work during which I learnt some very interesting things. A surprising one is that the library I work at does not meet the legal definition of a library because its resources are not available to the general public and we do not offer an interlibrary loan service! The session slides are up on Slideshare here. Another thing I learnt is that there are large sections of copyright law that are considered 'grey areas', and that many of these grey areas are to do with digital content. For example, is it ever a breach of copyright to publish hyperlinks? No one has ever been prosecuted for it, but it remains a grey area. The points the presenter made about publishing on social media were also interesting. Contracts and licences override copyright. Whenever you sign up to a social media site such as Facebook, Twitter, Blogger or Instagram for example, you are agreeing with their terms of service which are not always favourable to the individual. I decided to have a careful look at Blogger's Terms of Service, which come under the broader Google Terms of Service. Of particular interest is what social media sites say they will do with content uploaded by users. Have a look for yourself, but they basically say that you're giving Google a licence to use your content for a wide range of activities that they define in the TOS, but which seems to be limited to operating, promoting and improving Google services. It was clear from today's presentation that copyright law isn't keeping up to date with what we are able to do with digital technology, both as individuals and organisations. The Australian Digital Alliance are pushing to right this copyright imbalance that is being discussed as part of the present copyright inquiry in Australia. They have produced a nice interactive micro-site full of copyright wrongs - check it out here. A fun fact from the microsite to finish with - did you know that it is an infringement of copyright law to include a YouTube video in a presentation to colleagues at work or at a conference? You can show them the clip on the YouTube site however, if I understand correctly. This copyright law is a very tricky business!